The Montessori method of education is a time-tested, child-centered educational approach developed by Dr. Maria Montessori in the early 1900s. It is based on scientific observations of children from birth to adulthood and is respected worldwide as one of the most successful and enduring educational models of all time. We now have a century of data about Montessori and its graduates. We know that they perform exceedingly well academically relative to their non-Montessori peers, and we know that there are numerous other benefits from a Montessori education, such as self-confidence, social agility, independence, self-sufficiency and an enduring zeal for learning. Through the guidance of trained Montessori teachers and a classroom carefully prepared with self-correcting and sequenced materials, children are encouraged to grow in their independence, curiosity, and problem solving. Montessori supports every aspect of a child's development: physical, social, emotional, and cognitive. The power of the Montessori approach inspired our founder, Dr. Jennifer Jones, and founding Head of School, Eileen Baker, to incorporate Montessori methods and materials into the International Baccalaureate Primary Years Program (or PYP) at Pine Street School. They brought two of the world’s most effective early education programs together in a unique and powerful combination that is transforming learning for children ages 2-4. 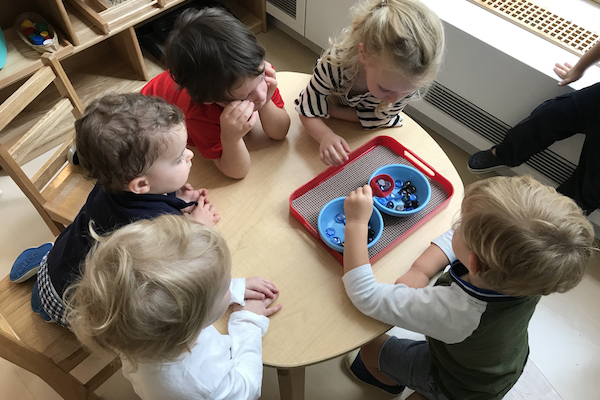 Pine Street School is proud to be the only school in New York City (and one of few in the world) to offer a Preschool that is PYP-based in which Montessori methods and materials are used. While we are not a pure Montessori school, we incorporate key elements of Montessori throughout our Preschool program, and all of our Preschool teachers are either Montessori certified or have been through extensive Montessori training (see more about our training approach below). Therefore, our Preschool teachers are trained in Montessori and the PYP. Visiting our Preschool classrooms, one can see the influence of Montessori everywhere. Our students learn early how to be self-sufficient and work independently or with partners. You will see them selecting and carefully carrying trays of “works” from shelves to tables or floor mats. They may invite a friend to collaborate. If they are hungry, they will find the snack station and take a moment to sit and eat, perhaps with a friend. Those who are toilet independent will find the restroom as they need it. The works (materials) themselves are the hallmark of a Montessori environment. These materials are beautiful. Intentionally designed by Dr. Maria Montessori to be enticing to young children who want to touch and tinker. Our Preschool shelves are filled with these lovely, tactile materials, each with a clear and thoughtful purpose and a design that allows the child to explore and self-correct.Montessori protocol of marking their work before walking away, so that everyone knows not to disturb it. They will be sure to put work away when done so that the next person to select it has a pleasant experience. As in any Montessori classroom, our Montessori materials are organized on shelves by subject. This organization enables children to easily find materials they are interested in or wish to return to. Language development is woven throughout every aspect of the classroom through rich, oral language opportunities, such as conversations, stories, and poetry. 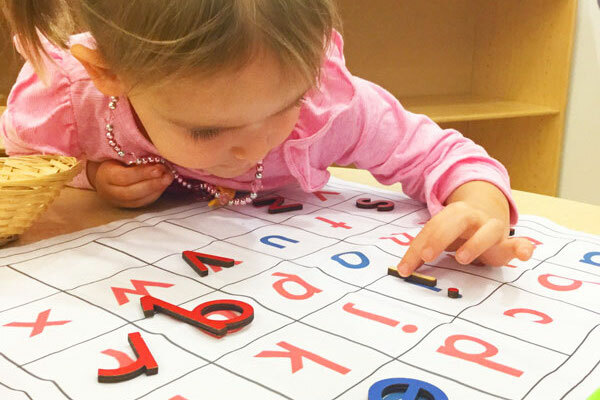 The children also work extensively with various didactic materials, such as sandpaper letters, which allow them to trace or manipulate the letters of the alphabet while learning the phonetic sound each makes. The activities in this area also include word building materials, writing, the study of grammar, and the classroom library. Children have access to concrete mathematical materials that represent all types of mathematical quantities. 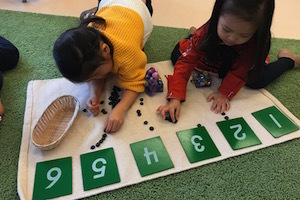 By combining, separating, sharing, counting, and comparing this equipment, children demonstrate to themselves the basic operations of mathematics. The manipulation of these materials is intended to foster a solid understanding of basic mathematical principles that prepares children for the abstract reasoning and problem-solving capabilities they will need later. Large maps of different continents are available for the children to manipulate. Children eventually learn the names of different countries as well as various facts about each one. The maps provide concrete illustrations of many geographical facts. Children also learn the common land formations. The children gain an awareness of the world around them by exploring other countries, their customs, religions, food, music, climate, language, and animals. For young children, there is something special about tasks that an adult considers ordinary - for example, washing dishes, making juice, and polishing shoes. In the practical life area of the classroom, children take part in activities that allow them to act like their older role models. Such activities help children perfect their coordination and refine their motor control; continue to learn grace and courtesy, and care for themselves and their environment; lengthen their span of concentration; pay attention to details; learn good working habits as they finish each task and put away all the materials before beginning another activity. From the sandpaper letters to the colorful bead cabinet, the spaces are designed to facilitate exploration, delight the senses and invite learning. And what makes a Montessori classroom even better? The beautifully complex and rigorously deep PYP Unit of Inquiry (see sample units here) which extend the students' exploration of the environment beyond Montessori materials and expand international-mindedness. What Are Typical Activities in Our Montessori-PYP Setting? What Do Montessori and PYP Have in Common? A key feature of a pure Montessori environment is a 3-hour independent work cycle. During this time, children are invited to make choices among the works in the space and primarily work alone or with friends, as teachers float to observe and provide support as needed. In this experience, the materials are central, and most of the work is quiet and solitary. In the PYP, children are invited to participate regularly in collaborative group discussions, facilitated by teachers. Small and large group lessons are conducted in which students have substantial voice, but these lessons are more teacher-directed than lessons would be in a Montessori setting. Student activities in the PYP are guided by themes and topics. 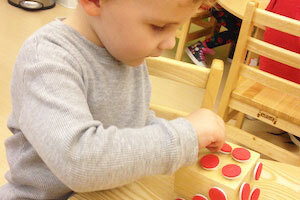 In a pure Montessori classroom, the curriculum is whatever the student chooses from the shelf. In a PYP classroom, the curriculum is an inquiry guided by the teacher and informed by ideas, interests and choices that students generate. There is more teacher direction in a PYP classroom than in one that is pure Montessori. We often say to parents touring our Preschool “Montessori is on the shelves and PYP is on the walls.” This is because as you move through our space, you will see the classic Montessori materials (the Montessori “curriculum”) on the shelves, and you will see walls filled with charts, original student work, and research generated from PYP-related collaborative group activity. In a pure Montessori environment, you will find children ages 3-6. While we believe that mixed-age groupings are beneficial for children, we separate ages in the PYP to prevent teachers from having to produce multiple units and planners. In the PYP, unit planning requires substantial teacher time and resource. The implementation of multiple units in the PYP would create undue burden on our teachers and undermine the success of the approach. We do, however, ensure that children throughout Preschool have constant interaction through recreation, outings, and art, music and theater. In numerous ways throughout the year, students across our Preschool, and in fact, across our entire school, collaborate across age groups in creative endeavors that support the cross-age mentoring that is typically found in a Montessori mixed-age classroom. Because we are a PYP-based Preschool, we do not certify our teachers in Montessori. However, we do ensure that each teacher is properly trained in Montessori practices and in supporting use of Montessori materials. We do this using a three-pronged approach. First, there is always a Montessori-certified teacher in our Preschool who serves as the Montessori “expert” and ensures that practices throughout our Preschool are consistent with Montessori guidelines. Second, we require all Preschool teachers to undergo Montessori training with an established Montessori education provider, such as NYC’s prestigious West Side Montessori School Teacher Education Program or the nationally respected North American Montessori Center. Third, we leverage the fact that our sister school, Battery Park Montessori, is one of the best Montessori programs in New York City, with highly trained teachers and an experienced Head of School. All year long, Pine Street School Preschool teachers receive ongoing training and support from the masterful team at Battery Park Montessori.